A $12.4 million grant, as part of the Science and Industry Endowment Fund (SIEF), has been dedicated to the establishment of a new Advanced Resource Characterisation Facility (ARCF) in Perth. The ARCF is a new collaborative platform providing cutting-edge techniques that augment existing world-class infrastructure to help create a knowledge base that excels in geosciences research, industry application and training. The ARCF has been established within the National Resources Science Precinct (NRSP), a collaborative joint venture between the CSIRO, Curtin University and the University of Western Australia. Building on existing infrastructure, the ARCF has drawn together state-of-the-art analytical infrastructure for geoscience and resource characterisation already available between the NRSP’s foundation research partners, and established three new world-class instruments to fill identified gaps in advanced resource characterisation and provide a global hub for “metre-to-atomic-scale” analyses of rock cores. The benefits of creating such a facility, dedicated to addressing fundamental science questions for Australia’s most important industry, are unparalleled. A new governance structure has been established for the ARCF to increase effective collaboration amongst the foundation research partners, to optimise equipment utilisation, minimize duplication, encourage complementary work and attract a further cohort of world-class researchers to the State. Establishing the ARCF at this point in time has been significant for the development and success of the Precinct as a whole. The ARCF, as part of the globally-recognised NRSP, increases the capability to undertake industry-relevant science and provide the impetus for innovation in Australia’s resources sector. The total project value (including the SIEF grant) invested by the partners is $37.8 million over five years. The Maia Mapper is a laboratory-scale product designed and built by the CSIRO, utilising detector technology developed by the CSIRO and Brookhaven National Laboratory in New York. It captures previously unachievable spatial chemical detail from the micron scale up to a few centimetres in complex natural and manmade samples in realistic time. Previously, such imaging capability was only available using the Australian Synchrotron, where beam time was limited and adaptions had to be made to meet the specific requirements for mineral analysis. The ARCF now offers a step-change in this new technology and has expanded the scale of samples that can be analysed – bridging the gap in analysis scales between the mining and research sectors. A large sample area (218.8 x 47.2 mm) Maia trace element map of drill core from an IOCG deposit. Image shows Manganese in red, Strontium in green and Calcium in blue. Pixel size is 30um and the image comprises 11.5 million pixels. Image Source: CSIRO. NanoSIMS is an advanced characterisation technique that combines high-resolution imaging with mass spectrometry. NanoSIMS provides an order-of-magnitude increase in spatial resolution over conventional secondary ion mass spectrometry allowing the isotopic composition of minerals to be determined at micron scale. An earlier system established at UWA has attracted some of the world’s top stable isotope geochemists to Perth. The new system is a second generation instrument with increased mass range of isotopic measurements and substantially increased sensitivity. 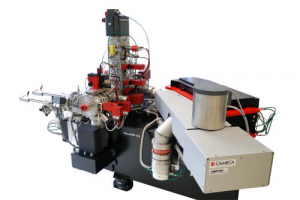 The next generation NanoSIMS from CAMECA, a flagship instrument of the Advanced Resource Characterisation Facility. Image Source: UWA. The Geoscience Atom Probe completes the analytical capability of the Facility by providing sub-nanometre, three dimensional spatial resolution and excellent analytical sensitivity. The Geoscience Atom Probe is a revolutionary characterisation tool that provides a three dimensional picture of atom distribution in very small volumes of natural material. The application of the Geoscience Atom Probe to geological materials is developing rapidly. In bringing a unique and world-leading suite of characterisation facilities together, the ARCF has developed a collaborative and workflow-approach to sample characterisation, allowing geoscientists to investigate drill core samples down to the atomic scale, without losing contextual information in the process. The facility will continue to provide routine, multi-scale element mapping of large samples, through to atomic scale geochronology, integrated with compositional and textural information. Since complexity is inherent in drill core samples, with diverse structures and textures related to deposition and mineralogical variation at multiple scales, this ability will allow the true determination of the timing of fluid flow, fluid–rock interaction, metal deposition and reservoir diagenesis, within a complete geological context. The ARCF team has provided access and expertise to enable many new and novel geoscience projects, resulting in numerous publications and conference abstracts. Two successful Australian Research Council Discovery Early Career Research Awards (DECRA) at UWA (Dr Haibo Jinag) and at Curtin University (Dr Denis Fougerouse) for ARCF postdocs. Fougerouse, D., Reddy, S.M., Saxey, D.W., Rickard, W.D.A., van Riessen, A., Micklethwaite, S. 2016. Nanoscale gold clusters in arsenopyrite controlled by growth-rate not concentration: evidence from atom probe microscopy. American Mineralogist Letter, 101, 1916-1919. Peterman, E.M., Reddy, S.M., Saxey, D.W., Snoeyenbos, D.R., Rickard, W.D.A., Fougerouse, D., Kylander-Clark, A. 2016. Nanogeochronology of discordant zircon measured by atom probe microscopy of Pb-enriched dislocation loops. Science Advances, 2, e1601318. Reddy, S.M., van Riessen, A., Saxey, D.W., T.E Johnson, Fischer, S., Rickard, W.D.A., Fougerouse, D, Prosa, T.J., Rice, K. Reinhard, D.A. Chen, Y., Olson, D. 2016. Mechanisms of impact-induced element migration in zircon resolved by atom probe microscopy. Geochimica et Cosmochimica Acta, 195, 158-170. Vikraman Selvaraja, Marco L Fiorentini, Heejin Jeon, Dany D Savard, Crystal K LaFlamme, Paul Guagliardo, Stefano Caruso, Thi-Hao Bui (2017) Evidence of local sourcing of sulfur and gold in an Archaean sediment-hosted gold deposit. Ore Geology Reviews, 89, 909-930. Barra F, Deditius A, Reich M, Kilburn MR, Guagliardo P, Roberts MP (2017) Dissecting the Re-Os molybdenite geochronometer. Scientific Reports, 7, 16504.